We have VK(3002m) prototype and that is the closest to a Panther Tank this game has ever got! AND that is only few patches ago, after it got 85mm UFP. We have the Pudel. The Abomination of... what in the gods name is it, Ausf.A turret ? Maybe? with Ausf.G Hull? Maybe F? ...well AT LEAST it does not have the L100 clown gun you say, better be happy oh HAPPY DAYS! When do Panthers get 250mm turrets?? Better mobility maybe, why is PREMIUM Panther88 limited to only 46kmh ??? I'd like to get 200mm effective hull + some spaced armor for the REAR with 260mm turret front on my panther88, come on Centurion5 goes ONLY 50kmh on flat LOL. They ruined the tech tree Panther when they dropped it from tier VIII to VII. Then they brought back the tier VIII as Panther 88 but it didn't get the old Panther mobility. As for historical. Well there's the Panther/M10. Edited by 5everin, 06 April 2019 - 01:55 AM. You got any proofs for that fantasy story? No centurion1 had ever, anywhere on this planet have more than 152mm of turret armor. Oh man, so they "RESTORED" them from your FANTASY DREAM 200mm to 250mm, are you hallucinating??? But they fixed that, it is time to restore but just add 50% on top, because it was a SUITABLY LONG DELAY so make Tiger1 front 400mm and sides/back 300/300. Edited by Innapropriate_Username, 10 April 2019 - 03:21 PM. Thank you for WASTING 48minutes of my Life. Let me ask you, are you doing this on purpose? Are you one of those who thinks E75 is "FINE" and does not need to go down to tier8? That would explain a LOT. Sometimes I wonder why I even try, you are all like sheep repeating things Jingles told you in some video from 2012, even Skill4ltu "thinks" that Tiger2 turret front is "Something around 200", nobody knows any facts, only anecdotal word of mouth opinions, wrong every single time. Wow, Centurion was robbed of 12.6mm of armor, so it is fair to compensate it with 254mm Turret and 88.9mm roof. 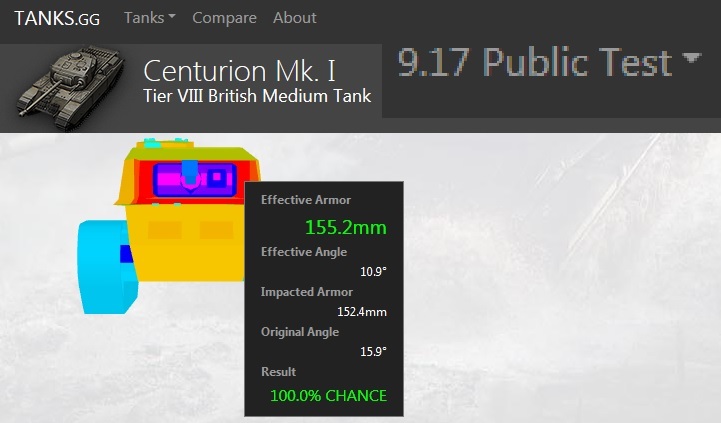 New and "restored" Centurion does not have 0mm+100mm SPACED gun mantlet? HMMMMMMMMMMMMMMMMMMMMMMMM? Can you tell me WHY ??? Oooohhh... I know, that "restoration" was awarded to GERMAN TANKS !!! I really liked VK 30.02 (M), but as I want to get to E 50 I got myself a Panther. Only a few games in, but it feels dreadful. I feel I will lose a lot of hair before I get past it, or somehow manage to find joy in the cat. Rather than admitting you were wrong for calling me a liar for no good reason ...You attempt to twist what I and that video had to say and show. My turn now... You are full sof sh*t trying to cherry pick and and build a straw man from what was shown in that video. Anyone who cares to watch it can plainly see that you were wrong and desperatly trying to save face by hurling more crap around. Oh and while I'm at it you sound like a spoiled 6 year old ranting because they have to eat all their dinner. You know nothing about my views on the German tech tree. Certainly not from this thread as I have not given any! B) The mantlet that covered most of the front of the turret. Apart from one small hole (which was also mentioned in the video and highlighted by you) was 200mm+ did you not notice the values going upto about 550mm in parts, or were your eyes shut for that bit? did you have your fingers in your ears for the bit where he says : and the mantlet...just don't shoot the mantlet? The weakest part of the turret face was shown to be 160-170mm you know the small areas around the mantlet before the slope again puts the effective armour way over 200mm..
Did you have the sound turned off when he was talking about the then upcomming turret nerfs for the HD models? So: did the turret have weakspots ..yes. Was most of the front of the turret 200mm+ yes! Edited by 5everin, 12 April 2019 - 04:47 PM. Play as a TD as long you are bottom or mid. Take pos from where you can shoot consistently, continuosly and that can give you a rapid/secure escape route. Still carefull as a top tier. Keep in consideration the weight, it's the heaviest med at tier 7 and can beat some tier 8 too, the ramming speed+ramming skill could sometimes give help and fun. Yep, but sometime it work in your favor. People will not usually run away if they get a stealth hit for few hp so before they will get in cover you could manage to land some more shots. It should work as an annoying mosquito. Don't get me wrong, im not here trying to say that the tank is epic, or a keeper but if it will get used correctly could give some refresh. It's not easysoviet or dumbproof hulldown tank. Edited by Thejagdpanther, 12 April 2019 - 04:05 PM. That it ain't, man. That it ain't. Just feels a really rude awakening after the VK (which seems pretty awesome for its tier). Too long since I played it to give any real advice but support role I guess. Edited by 5everin, 12 April 2019 - 04:49 PM. This was wrong, The Pre-HD version had 165mm as seen on evidence above. You can hang me for that 12mm difference I was Wrong. A) - has nothing to do with ANYTHING, except when fighting against Tier10 HEAT, like E75 Turret roof is 60mm and is auto-pen for HEAT, while Centurion 88.9mm will bounce HEAT. So, Tier8 Centurion deserves to have stronger Turret Roof than German Tier9 "Super"Heavy??? Part of "Restoration"? B) Mantlet that covers MOST? What is MOST? Do you want to get a grid and measure in percentages how much what part takes, or we just talk like savages and use body parts for size reference? "...just don't shoot the mantlet?" - I'll take this as proof you were not thinking straight. Weakest part, Strongest part, you are comparing relative armor thickness on sloped parts - and that has nothing to do with nominal armor value, you do not count angled parts same as you would not count parts where mantlet overlaps with armor - those are maximal possible values that don't represent "Turret Front Armor Value" by definition. You do understand, That same part where "Original" Turret had "200mm Effective" armor value, is still present on New Centurion, but this time Base value is not 165mm but 256mm? He talking about "upcomming nerfs and models" is some irrelevant guy talking about WarGaming - a Fantasy Anti-German Bias Company, that cares nothing about Historical values, Real Life values or Truth. 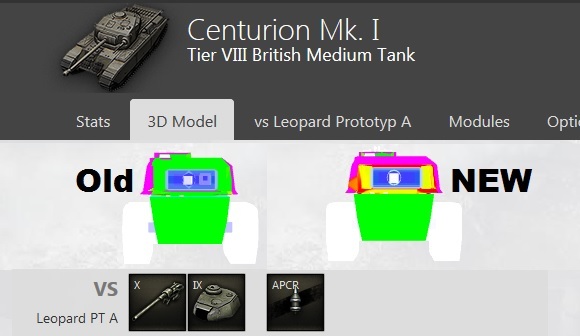 They had "Pre-HD" model of Centurion all wrong, but when they made first "HD" model they still got it wrong. Why was "First HD" turret weaker? - Maybe you need to look up real life values, at that time WG was still selling us lies how they try to be accurate to history. And the fact that Original Turret had some areas effective around 200mm does not mean that "NEW" Centurion deserves 256mm Turret AND Mantlet - AS THE MINIMUM BASE VALUE. From where does extra 50mm come from???????? If you are interested in what TRUE armor on centurion is, you are welcome to look it up yourself, from Wikipedia to any other source you will find it is 150-160mm for Turret Front, anything other is pure fantasy. This just boils my blood. Like its some restoration that Centurions Deserve??? Against all history and Truth, while at the same time Tigers and Panthers must have "Historical" values because otherwise would brake the game, like Tiger1E with 25mm Roof. That is the definition of how much WarGaming has brainwashed everybody, and now after all new fantasy armor values nobody has any idea what real tanks had or were. How is 88.9mm Roof a restoration? If value was around 200mm how is 300mm restoration?? Mantlet had only 100mm parts - HOW IS 250mm GUN MANTLET A RESTORATION???? Only thing you can pick up from all this mess is that FROM THE VERY START of the game - Centurion had "OverBuffed Turret" - Stronger than in real life or any other game. While Panther kept its (worse than in) "History" Values. So if Centurion at some odd angle gave 200mm values on turret.... Why did German tanks not receive same Justice? Why no 256mm Turret Front Armor for Panther2 tank? E50???? No no, It is worse, for German Panther2 / E50+, they had BIG gun mantlets - and they removed even that, today's Tier8,9 and 10 German tanks have WEAKER Turret's than Pre-HD models. Centurion's and other similar tanks DOMINATE every Tiger/Panther variant in Turret armor department - and it is all made up fantasy. Still posting crap as an attempt to save face I see. My advice.. Stop digging and throw away the shovel. Again for the slow.. My point A) had bugger all to do with HEAT. It meant that with a small amount of slope that area went from weak point to impenetrable. And in case you are still not getting it.... Impenetrable beats 240-260mm of armour. Edited by 5everin, 18 April 2019 - 01:40 AM. The original had 200mm + of armour on its turret face as I said it did and you called me a lair for saying it. Sorry but that is a lie, it did not have "200mm of armor", the GAME said it was 165mm, the ARMOR MODEL displayed 165mm, everywhere clearly reads "165/112/112 Turret Armor (Front/sides/rear mm)"
Ok, if you want to call the effective armor "Not if you get the angle just right, but 200mm", why does today's Centurion1 have "Not if you get the angle just right, but 350mm" of armor? From where magic +100mm ??? On today's centurion turret face the 254mm is THE WEAKEST PART of whole Turret front! ...but you insist to call old turret by maximal values while you call new turret by minimal values??? Bugger all to do with HEAT? Ohhhh, by "small amount of slope that area went from weak point to impenetrable" you meant > 70°Ricochet? Hmmm.... Seams like your IMPENETRABLE area is cut like butter even with low-pen HEAT. Or maybe you just don't know what word IMPENETRABLE even means? The fact that Tier8 MEDIUM tank got Turret roof buff from 50.8mm to 88.9mm is a BIG DEAL, because that makes NEW Centurion1 turret front much stronger than Tier9 E75 German "HEAVY" Tank. They both have "250mm" armor on weakest front part, they both have sloped angled Turret Roof, but E75 is stuck with 60mm, while 1tier lower Medium tank that had 50mm, now has 88.9, that is 30mm more than one tier higher heavy tank. Why have you exactly started talking about panthers and ended in centurions? Why no same buff for Panther88? 300mm Turret front? Just like Centurions? Why does Panther2 not get 300mm Turret Front.... even worse, they removed gun-mantlet so it is even weaker now. They will never get Fantasy Armor because they are German tanks, and this is anti-german bias game. Keep German tanks worse than in real history, and give fantasy over-buffs to every other tank. Whole British tech-tree was fantasy-buffed, whole AT line, over 200mm armor on Tier6, that is better armor than Ferdinand on Tier8. Medium line (centurions) get.... well, 300mm+ effective armor turrets from tier8 and up, Heavy line got same Turret buffs + Hull 250mm+ armor on side under the turret, while german Tier10 tanks have under-turret hull as weak-spot, even Lowe has under-turret hull weakspot, but cant have that on Caernarvon - tank with monster DPM on top of magic armor, and Conquerors and new Chieftain are JUST FINE, perfect balance blyat. And still not one single real Panther tank in the game. Soviet tanks like KV-2? no problem, here, premium copy so you can have 2! But every year they celebrate Centurion Tank day... oh wait, no, that's Tiger day. You see that large magenta and blue area covering the majority of the front of the turret? How much armour is that? is it 165mm? or is it more? And please stop waving around the 165mm figure from the garage as the max armour. 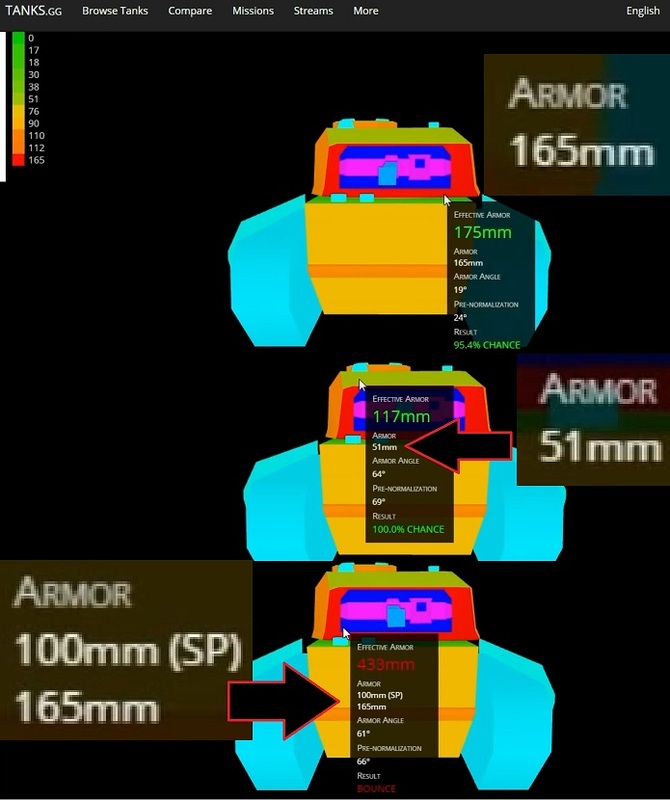 This was never an accurate value for any tanks armour layout and only ever gave the value for one plate never the whole thing and was not representative of the armour protection. The turret brow could easily be made impenetrable and you know it! the tank is capable of -10 degrees gun depression I quoted 5 degrees off the top of my head from memory after what, four years?. Try that armour inspector with 7-8 degrees of angle and see what happens. @olmocap Apologies for going o/t. I was only trying to make the point that the Centurions started this game as tough turreted ridge fighters, lost the ability when they got nerfed and were returned to that status after a long interval and not just the product of some random buffing excercise as implied in the o/p. You can/have read the fallout from making that statement. Slighty more on topic: the Germans are getting a round of buffs in the in the 1.6 patch I think.. E100, Tiger 2 & Leo1 for sure and a few others in tiers 8-10 I suspect. they also Had a round of buffs about a year or so ago...maus etc. Edited by 5everin, 20 April 2019 - 05:55 PM.